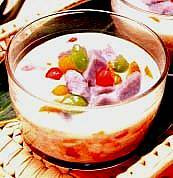 A popular Nyonya dessert called 'Bubur Cha-Cha'. Nyonya are the descendents of Chinese-Malay marriages, the male being known as Baba and the female as Nyonya, pronounced nyoh-nyah and sometimes spelt Nonya. Although the first communities first proliferated in Malacca, many Babas and Nyonyas settled in Penang and Singapore - and therefore - were also called Straits Chinese. This unique marriage of cultures also resulted in a novel marriage of cuisines, both Chinese and Malay, and is what is now known in Malaysia as Nyonya food. While Nyonya food contains many of the traditional ingredients of Chinese food and Malay spices and herbs, Nyonya cuisine is eclectically seasoned and different than either Chinese or Malay food. Nyonya food originating from the North of Malaysia - Penang, and Nyonya food originating from the South - Malacca and Singapore, have distinct differences. Nyonya cooking in the South have an Indonesian influence. The food is generally sweeter and richer with the addition of coconut milk and more traditional Malay spices. Meanwhile, Nyonya food in the North drew inspiration from neighboring Thailand. Nyonya food in the North, specifically Penang, has a preference for tangy or sour food, using tamarind paste and green mangoes. Nyonya cuisine is also famous for it's Kuih [cake or dessert]. Nyonya desserts are varied and extraordinary. They are strongly Malay influenced and made from ingredients like sweet potato, yams, glutinous rice, gula Melaka [palm sugar], agar agar, coconut milk and even beans like red bean and green or mung beans. Just as the ubiquitous vanilla bean is used in desserts, Pandan are used, giving Nyonya desserts it's signature quintessence! Put (A) into a steaming tray and steam with high heat for 20 minutes until soft. Put tapioca flour and salt into a mixing bowl; pour in boiling water and stir well. Cover and leave aside for 15 minutes. Mix and knead into a non-stick dough. Divide the dough into 3 portions; mix one portion with red colouring; 1 portion with yellow and l portion with green. Roll each portion into a long thin sausage shape and dice into cubes. Bring 1/2 pot of water to boil; put in tapioca flour cubes and cook until all the cubes float up. Dish up and soak in ice water. Dish up and drain. Put all ingredients (B) in a pot, bring to a boil; keep stirring until sugar is dissolved. When it comes to a boil, turn off the heat and add (A), colourful starch cubes and mix well. Serve hot or cold as a dessert. I'm really very very happy to know the way to make the tapioca cubes. I like to eat but don't know how to cook. Now I can try to cook! Good recipe..I'll make it for my mother for Mother's day. I'm sure she will smile! this recipe is the best i've ever tried and will be making more of it for my family and friends!!! Thanks for the recipe. Needed it so much for my project. My teacher is even trying it out. WAH , SHIOK LIKE MAD :D [slurpslurp] yum yum.